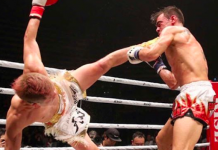 On New Years Eve in Tokyo, Japan, in the main event of RIZIN 14, 20-year-old Japanese kickboxing star Tenshin Nasukawa stepped through the ropes for an exhibition boxing match with undefeated legend Floyd Mayweather Jr.
Because this fight was an exhibition, it would not wind up on either fighters record, no matter the outcome. All the same, Nasukawa hoped to do the unthinkable and knock the Floyd Mayweather out. Unfortunately, this bout went rather disastrously for him. Moments after the opening bell, the much larger Floyd Mayweather was plowing forward, clubbing Tenshin Nasukawa with huge power shots. 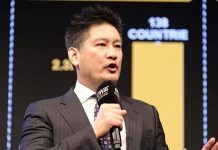 Before the first of the bout’s three three-minute rounds had ended, Nasukawa had been knocked down for a third time, and his corner was throwing in the towel to protect him from further punishment (see it here). 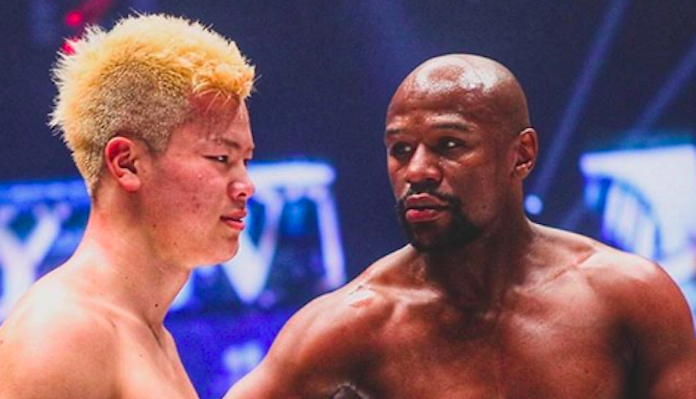 Speaking on Instagram on Wednesday, Tenshin Nasukawa meditated on this loss to Mayweather, admitting that he probably wasn’t ready for the opportunity, and that underestimated his foe. I have worked hard with a big dream in the combat world. Karate, Kickboxing, MMA and Boxing. When I first got the offer I took it in a flash. I thought this was an opportunity of a lifetime, and although there were significant differences in accomplishments and weight classes, I felt that I must not run and take on the challenge. The days since the fight was confirmed have been enjoyable but with concerns, and I spent the time thinking about many things. At the end of the day, I got finished, but I have no regrets. I am disappointed at myself since I thought I could have done better. But I will face the facts and will continue to take on any challenge. I learned that I didn’t work hard enough to earn this opportunity, and I will use this defeat to improve myself and move forward this year. Despite all the things that happened leading up to the fight, I came to realize how truly great Mayweather was. I was the one underestimating him. I promise to make it to that level! It may take some time for me to become the man to haul the industry on my shoulders, but please continue to support me! 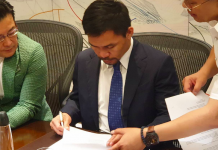 Everybody who work to make this fight happen, thank you very much. Mr. Mayweather, thank you very much. – Tenshin Nasukawa on Instagram (h/t MMAMania). What did you think of the RIZIN 14 fight between Tenshin Nasukawa and Floyd Mayweather?